Chicago – Biologic disease-modifying antirheumatic drugs (bDMARDs) appear to modify impairments in vascular function in patients with rheumatoid arthritis (RA), according to preliminary results from a randomized trial presented as a latebreaker at the 2018 ACR/ARHP Annual Meeting. The effect, a possible mechanism of cardioprotection, appeared to be different with a bDMARD than with conventional DMARDs (csDMARD) offering similar control of RA symptoms. “Inflammation is believed to be the primary contributor to excess cardiovascular disease in RA patients, but little is understood about the degree to which anti-inflammatory therapies affect cardiovascular risk,” reported Dr. Maya H. Buch, Leeds Institute of Rheumatic and Musculoskeletal Medicine, UK. While previous studies at her center have shown that RA patients have vascular abnormalities, such as impaired aortic distention, this new set of studies suggest the risk is modifiable with RA therapy. In this study, RA patients without a history of cardiovascular disease underwent cardiac MRI (CMR) within a year of the onset of symptoms but before receiving treatment. The 81 patients with vascular abnormalities on CMR were then randomized to a first-line bDMARD TNF inhibitor (etanercept) plus methotrexate or to methotrexate with other csDMARDs in a treat-to-target escalation protocol. Those in the second group with a failure to achieve a DAS28-ESR remission by week 24 were switched to etanercept plus methotrexate. The others in the second group remained on the csDMARD regimen. The primary endpoint was change in aortic distensibility but other vascular or cardiac measures, such as change in left ventricular mass, were evaluated. The median age of the study population was 49.4 years. The mean baseline DAS28 and CRP measures were 5.6 and 8 mg/L, respectively. From the baseline to the end of the first year of treatment, there was a significant reduction in geometric mean aortic distensibility in all patients regardless of assigned treatment (2.99 vs. 3.59 mmHg; P<0.01). Although there were no differences between responders versus non-responders for this primary endpoint, there was a difference between bDMARD and non-bDMARD exposed patients. “When the Group 1 etanercept responders were compared to those in Group 2 who responded to csDMARD, there was a 16% difference favoring etanercept for improvement in aortic distensibility,” Dr. Buch reported. Although she conceded that the difference, expressed as a hazard ratio of 0.84 favoring bDMARD treatment, did not reach statistical significance (P=0.3), she believes the difference might become significant in a larger trial (Fig. 1). 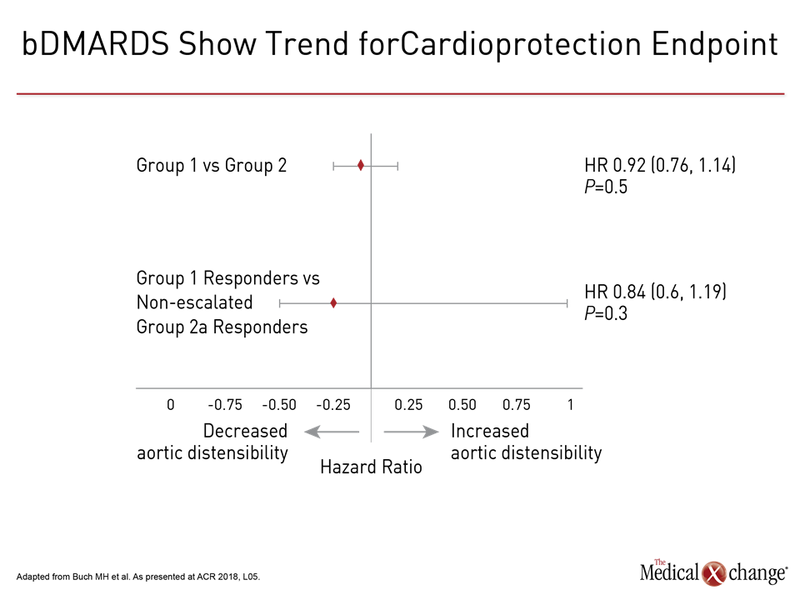 Overall, she emphasized that change in aortic distensibility did not necessarily correlate with RA clinical benefit. If validated by additional studies, the favorable impact of bDMARD treatment on cardiovascular risk might reorient first-line therapy, particularly in those with elevated cardiovascular risk, Dr. Buch suggested. Although it must be shown that protection against development of cardiovascular abnormalities translates into a reduced risk of cardiovascular events, these initial results “would suggest that bDMARDs plus methotrexate confers a greater benefit over conventional DMARDs as initial RA therapy” when both RA and cardiovascular outcomes are considered.